Is social media reshaping the way we learn? Diminishing are the days where people take to newspapers, magazines or television stations to catch up on the trending news or latest information. Social media platforms like Facebook and Twitter have already proven to be favorable hosts for trending news topics, and the perfect platfrom to interact directly with their customer. Since most of us have access to desktops, tablets, and mobile devices and use social media on a regular basis, we easily have access to brands and celebrities we never thought possible. Let’s take a look at these astonishing facts about social media use: With over 3 billion active Internet users, nearly 2.1 billion people have social media accounts and 3.65 billion mobile users have access to the internet via smartphones and tablets. Also, about one-third of adults under 30 get news on social networks now. It’s clear now, that consumers expect answers and results from the brands that they so easily can reach out to, 24/7/365 through social media. Will real time, live-streaming video apps change the game even further? Welcome to the era of the live stream. Interacting with brands and consuming news through new forms of technology is getting more popular, and new players are entering the game every day. In this post, I intend to dive deeper into the growing notoriety of live-streaming apps, specifically, Meerkat and Periscope, and how they are further challenging the way we typically consume information. 89% of time spent on media is through mobile apps. Just let that sink in for a moment. More people are turning to their mobile devices to complete tasks instead of their desktops. Live streaming apps seem to be popping up left and right, so we are here to set the record straight about the benefits of the top two free contenders, Meerkat and Periscope. Live streaming apps allow users to be the first to break the news to their peers and share first-hand accounts of news stories in real time. Meerkat vs. Periscope: What’s the difference? In the past few months, both Meerkat and Twitter’s Periscope have gained a massive amount of users, streaming everything from their daily chores to popular events. Whoever is watching you at the time can comment and ask questions during your broadcast, making it easy to answer and interact immediately. But, just how popular are these apps when stacked against each other? When compared side by side, both Meerkat and Periscope share several important features, the main one being the ability to tweet a link to a live-streaming video straight from your iPhone (neither app is available in full for Android yet). Also, they each contain their own way for viewers to like the videos, and they have the option to save the streams to your phone once you finish. In addition, both allow public chats within the videos. However, the similarities seem to stop there. Read on to learn about the differences between Meerkat and Periscope and decide for yourself which will take the title for the best live-stream app. While Meerkat’s popularity seems to have already leveled off, they’re not going down without a fight. 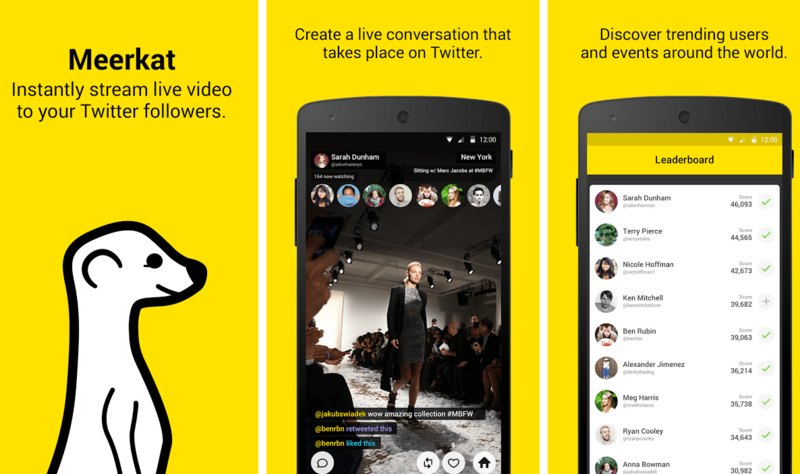 Meerkat is continually growing and testing the limits of live-streaming capabilities. The app will soon enable users to discover other Meerkat users and will allow people to re-watch Meerkat live streams. Ability to re-watch any video from your followers for 24 hours after the live broadcast. It’s hard to deny that Periscope currently holds the advantage due to the support from Twitter. Looking at the data provided by Topsy, Periscope seems to be gaining more support each day. With the introduction of Periscope and Meerkat, there’s no longer a barrier to entry for live streaming our lives. All you need is a phone with video capability and the app, and voila – you’re live-streaming. Brands that are aggressive on social media have wasted no time experimenting with live-streaming. As more brands join in on the live-streaming fun, it’s becoming clear that it will play a major role in digital and social marketing in the future. Brands like Spotify, Pepsi, Red Bull, and Mountain Dew are successfully using Periscope and other live-streaming apps to enhance their customer service and marketing. Now is the perfect time to start experimenting with live streaming to see if it works for your brand. The companies that are able to build a strong foundation in the beginning stages will reap long-term benefits down the road as live-streaming continues to expand its features and becomes a regular marketing tool. However, these apps don’t completely come without faults.Recent events have lead Twitter and Periscope to enforce certain rules pertaining to the usage of their apps for copyrighted and live events. The app landed in hot water when people streamed the fifth season premiere of Game of Thrones and the Mayweather-Pacquiao fight. Both Meerkat and Periscope forbid users in their terms of service from posting videos that would constitute copyright infringement. Live-streaming a network’s broadcast of a show would violate that rule. Their purpose is not to stream illegally or video people without their consent. These apps are fun and have many benefits but just be careful how you use them so you don’t get yourself caught in some legal trouble. Have you used either of these apps before? If so, let us know what you think in the comments section. And remember, if you need some help staying on top of trending topics and figuring out social media’s latest and greatest tools, we’re always here to help. You can contact us here.